The tradition of putting shoes on horses began in medieval times, when humans first started to stable and confine horses. After a time in confinement the horses feet would start to deteriorate due to the lack of movement and near constant contact with excrement and urine. The tradition of shoeing was born to ‘’protect’’ the horses feet. Today, many horse owners believe shoeing to be a necessary part of horse management, and that going shoeless will cause excessive wear to their horses hooves. Even a balanced, naturally trimmed horse can still require trimming on a four to six weekly basis – despite working on roads and other ‘’hard’’ terrain. Wild horses travel 20-25 miles EVERY DAY over varying terrain, doing the things that come naturally – like eating, rolling, drinking and interacting and playing with each other. This near constant movement shapes their hooves into the perfect rock crunching, ground eating ‘’tool’’ to carry the horses safely over any challenging terrain they may meet. Very few (if any) of our horses travel these kind of distances (and varying terrains) every day. Your horse may not be wild, but with proper diet and movement and a consistent balanced natural trim he can enjoy the health, comfort and soundness that are natural for his wild relatives. 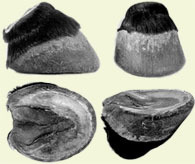 So what ARE some of the advantages of a balanced naturally trimmed hoof? Faster growing hoof due to better stimulation - and the faster it grows the quicker it heals! No more worrying about lost shoes and finding someone to put a new one on. Deciding to ‘’go barefoot’’ will be the start of a life changing and enriching experience for you and your horse. Your answers will provide the basis for your initial consultation, and will point you and your horse in the direction that most enables your horse to heal naturally – inside and out. Facilitating the healing of the horses hoof is usually 20% the trim and 80% the horses lifeway (meaning the movement, lifestyle, feed etc). To best work with your horses natural healing ability you may need to make management changes – both in relation to feed, turnout and other issues. This will be discussed at length with me on our first appointment, and re-adressed as often as needed. Hoof boots are an excellent temporary tools to enable you and your horse to continue riding and moving as much as possible. Patience - every horse is an individual.